1) Estimate your total of Bloodshot’s definitive on-panel kills between BLOODSHOT #1 (2012) and across all Valiant titles released by August 1st, 2017. Make as many guesses as you want, or scour through your back issues and collections for a more accurate number! 2) Post your estimate to the official Valiant Twitter account using the hashtag #BLOODSHOTBODYCOUNT between now and August 23rd, 2017. 3) Participants with the winning number will have their name printed in the BLOODSHOT SALVATION #1 RAMPAGE REDUX! 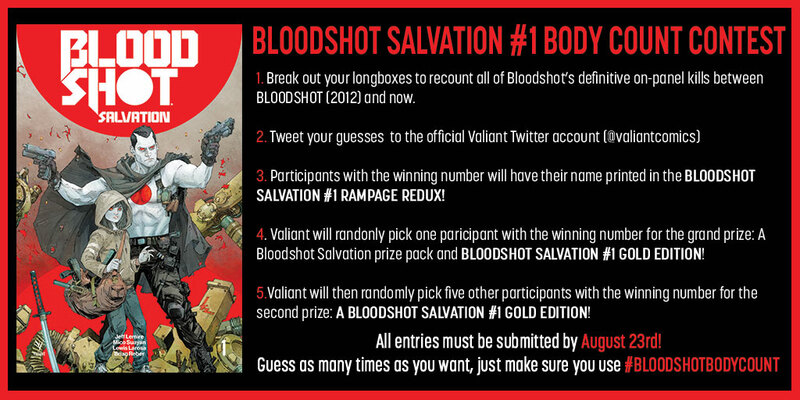 4) Valiant will randomly pick one participant with the winning number for the grand prize: A Bloodshot Salvation prize pack and BLOODSHOT SALVATION #1 GOLD EDITION! 5) Valiant will then randomly pick five other participants with the winning number for the second prize: A BLOODSHOT SALVATION #1 GOLD EDITION! The official tally will be revealed in the “Bloodshot’s Body Count” bonus feature, available only in the BLOODSHOT SALVATION #1 RAMPAGE REDUX edition – a FREE, LIMITED EDITION, and FULL-LENGTH COMIC BOOK polybagged alongside the BLOODSHOT SALVATION #1 PRE-ORDER EDITION — on September 20th. Available only as a pre-order exclusive, the BLOODSHOT SALVATION #1 RAMPAGE REDUX is the complete look into Ray Garrison’s violent past, complete with other revelatory bonus features like “Top-Secret Mission Reports,” “The Biology of Bloodshot,” and “The Complete History of Bloodshot”…along with a complete black and white presentation of BLOODSHOT SALVATION #1!